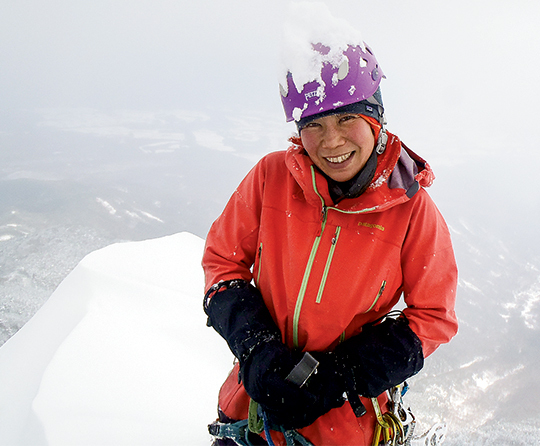 On December 21, Kei Taniguchi slipped and fell to her death while descending Mt. Kurodake (1984m) in Japan's Ishikari Mountains on Hokkaido. The Japan Times reports Taniguchi, 43, lost contact with her four teammates after she untied from the rope during a group break. "Police say evidence suggests she fell from a cliff to the northwest of the summit trail," states NHK World. Gloves belonging to her were later found, as well as tracks leading to where she likely fell. In 2009, Taniguchi and her partner Kazuya Hiraide received the Piolet d'Or after completing the first ascent of the Southeast Face of Kamet (7756m) in India, via the route Samurai Direct (WI5+ M5+, 1800m). Taniguchi was the first woman to win this award for climbs that represent the "spirit of alpinism." Her name is listed in ten entries in the American Alpine Journal from 2005 to 2015 for her significant climbs in Alaska, Nepal, Tibet, Pakistan and China. Taniguchi's essay "Being with the Mountain" appears in our latest issue, Alpinist 52—Winter 2015, as part of a feature on modern women alpinists titled "Freedom in the Hills." "To me, exploring unknown mountains resembles life itself," she wrote in Alpinist 52. "Like many people, I exist, today, entangled in immense infrastructures of data. But I'd like my future to remain mysterious. I want to visit regions with the least available information—to encounter raw nature as it truly is. When I begin to see and touch the land, I'll start discovering what I can do, how I can climb beyond the imaginable." 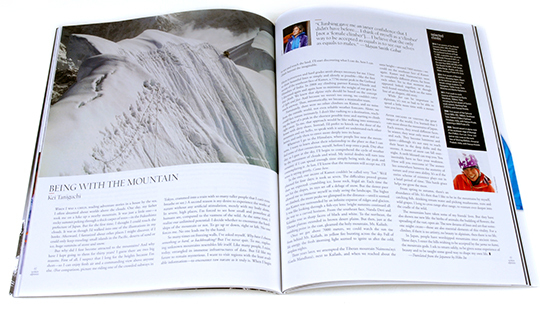 Taniguchi's story "Being with the Mountain" in Alpinist 52—Winter 2015. 2005: Second ascent in alpine style of the southeast ridge of Muztagh Ata (7546m), Kun Lun, China; and partial new route on the north face of Shivling (6543m), Himachal Pradesh, India, with Kazuya Hiraide. 2008: First ascent of the Samurai Direct (M5+ AI5, 1800m), Southeast Face, Kamet (7756m) Garhwal Himalaya, India, with Kazuya Hirade, receiving a 2009 Piolet d'Or. 2011: First south-to-north traverse of Naimona'nyi (Gurla Mandhata, 7694m), Tibet, including the first ascent of Gurla's south summit, Naofeng Peak (7422m), with Kazuya Hiraide. 2014: First ascent of Mansail (6242m), Mustang region, Nepal, as the technical advisor to four female college students, Eri Hasegawa, Yukiko Inoue, Kaho Mishima and Mariko Nakamura. 2014: First ascents of the Wasabi Concerto (AI4+ M5+ R) and the Wasabi Sonatine (WI4 M4) on the northeast buttress of Peak 11,300'; a possible new variation, the Wasabi Prelude (V 60 degrees), on the south face and a repeat of the east face (WI4 AI5 M5) of Mt. Dan Beard (10,260'), Ruth Gorge, Alaska Range, Alaska, with Junji Wada, earning a Piolet d'Or Asia. "She was a beautiful, intelligent, strong and cheerful woman, a great climber and a popular and skillful mountain bicycling tour guide. Kei's humor, grace and charm will indeed stay with me forever." RIP KEI - sorry that you a gone but the remembrance on you is still alive.